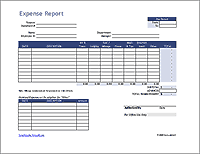 This expense report template was made for employees that need to submit reports on a weekly basis. It includes a section for expenses that need to be reimbursed, such as mileage and other travel expenses, and a section for amounts spent using the company credit card. It also includes a place for documenting specific expenses such as business meals. 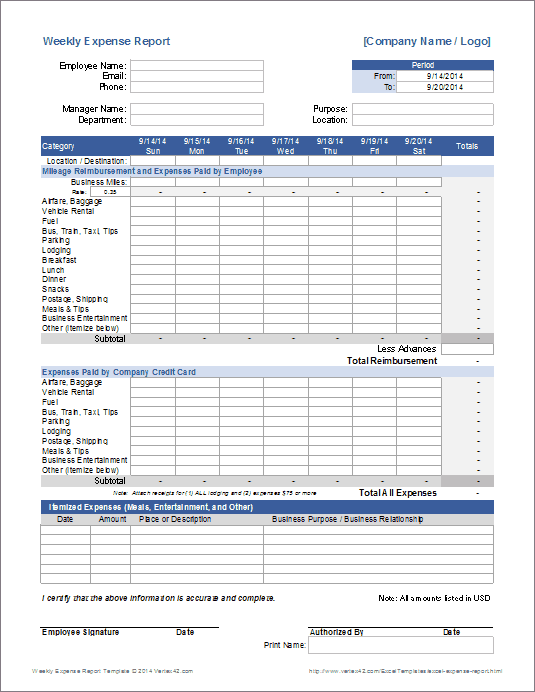 If you are in sales or another job that involves frequent driving and meetings with clients, you can use this form for reporting miles driven and reimbursable expenses. Use a separate mileage tracking log if you typically visit many clients and locations in a single day and need to record the business purpose and notes about the visits. This form also lets you report expenses paid using the company card. Important: When you pay for business meals or business entertainment, such as meetings with potential clients, you must keep records of the location, business purpose, business relationship, and the amount of each expense . See the references below for more details about record keeping requirements. Remember: Submit receipts and other supporting documentation (especially documentation regarding business meals and entertainment) along with the expense report. IRS: Record keeping - Explains what records are needed to prove expenses when claiming tax deductions. The documentation also includes a rough example of a weekly traveling expense and entertainment record (see Table 5-3). The template above was largely based on this example. IRS: Travel, Entertainment, Gift, and Car Expenses - Some tax guidelines that you should be familiar with if you are recording business expenses for tax deductions (either for yourself or for your employer).